Mitchell, widely known for his original and definitive translations of spiritual writings and poetry, has taken the work of Neruda (1904-1973), whose poems are passionate, humorous, and exceptionally accessible, and brought them to life for a whole new generation of listeners. 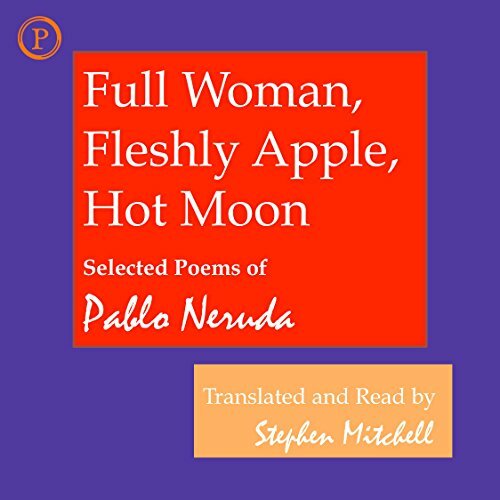 Mitchell has selected nearly 50 poems for this collection, which focuses on Neruda's mature period, beginning with Elemental Odes, published when he was 50 years old, and ending with Full Powers, published when he was 58. Odes to the Mundane, etc. a fragrance alive a crackling." Neruda has a gift for love poems, a gift for opening the book of life and translating its pages. I bought this book decades ago and it was peeped at, but never fully read. It wasn't his love poems. It wasn't The Captain's Verses. But upon my maturity, upon my ripening, I've discovered the maturity I need to understand these later Neruda poems. These Odes to the Mundane (Socks, Suits, Ironing, Onions). Neruda is both a South American Whitman and the Western Hemisphere's Horace. He finds gold everywhere. He tears the fleshy fruit from the seeds of truth that have been overlooked. It is easy to write a poem about love, but much harder to see the beauty of an onion. But delicately he unwraps it. He finds eroticism in the everyday. In that way, Neruda reminds me a bit of Edward Weston photographing peppers. His eye captures both the nature of the pepper and the nature of our human stare, our vision, our gaze. He discovers us in the inanimate. He finds humanity writhing under the rocks in the garden. Would you consider the audio edition of Full Woman, Fleshly Apple, Hot Moon to be better than the print version? Stephen Mitchell carefully reads each poem with conscious and clear pacing that emphasizes the nuances of Pablo Neruda's words. The translation is accurate. Neruda's poems are beautiful, thoughtful, humorous and touching. Mitchell gives them life with his voice. Yes, but there was a bit of an haunting sounding echo after each word was read. It wasn't bad, but it was a little distracting because there isn't any real strong silent pauses that would add impact to Neruda's words as read by Mitchell.